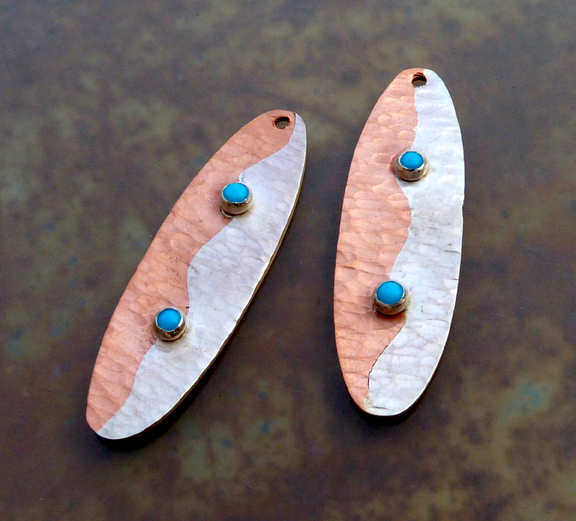 Entirely hand-fabricated (made by hand), hammered, copper and silver married metals earrings with turquoise. Hatha is sanskrit for Sun and Moon. 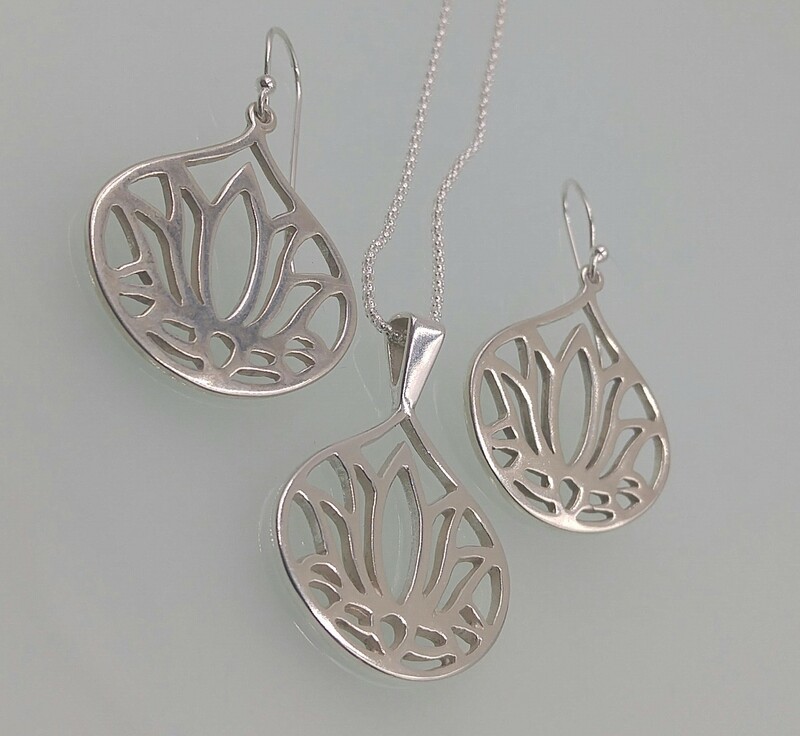 In these earrings, Sun is represented by copper and Moon by silver. 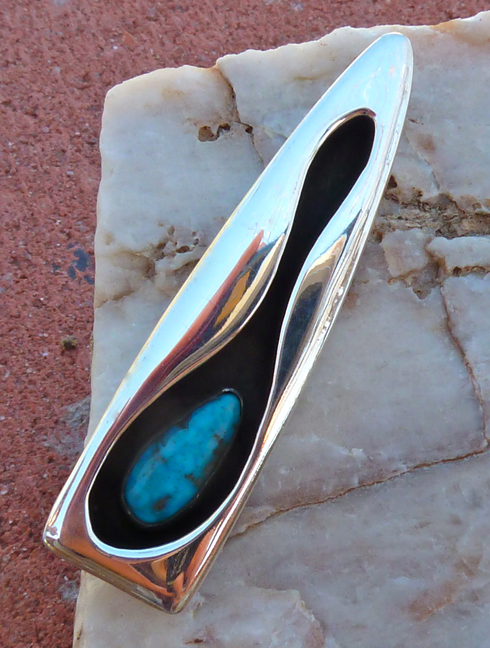 Two turquoise pieces represent balanced energy. Turquoise may also represent the sky and in the Hindu chakra system, it is the color of the Vishudda or throat chakra. Throat chakra represents Divine Will and communication. These photos were took before the earring wires were put on to make them dangling earrings. Wires are silver. 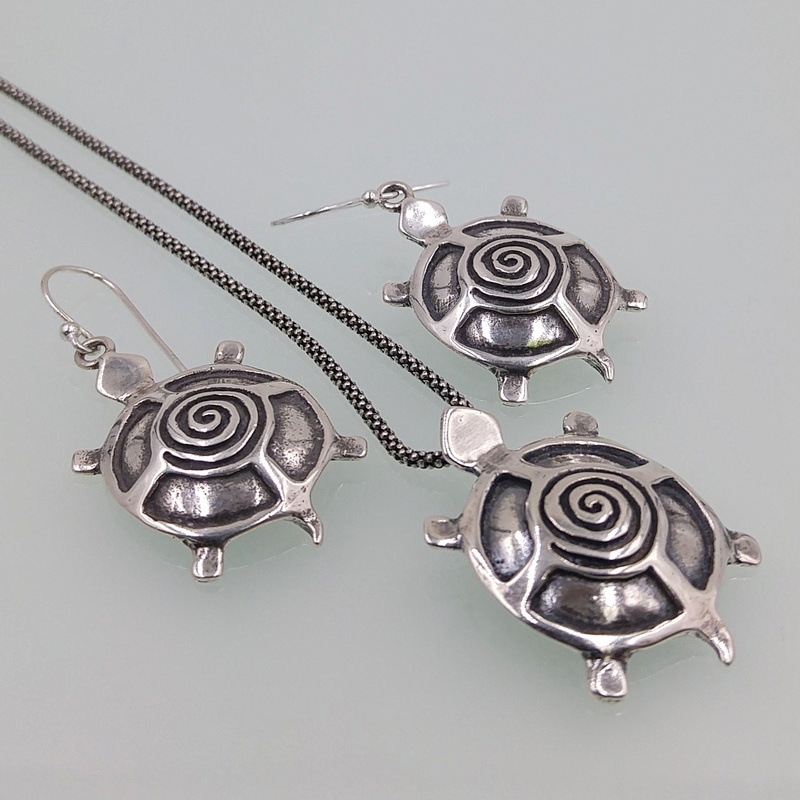 The earrings are approximately 1 3/4″ long by 1/2″ wide. Signed on the back. Entirely hand-made. No two earrings are alike. These earrings sold so quickly I didn’t get the chance to photograph them with the earring wires! 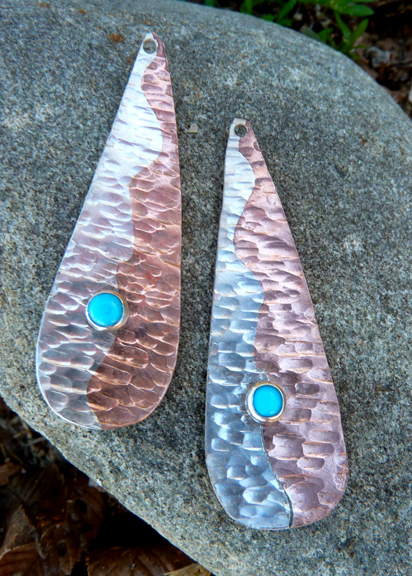 This pair is completely handmade – the copper and silver were cut out with a jeweler’s saw and hand-hammered. The fluctuations in the metal catch light so that there are gentle glimmers of light with the movement of the earrings. 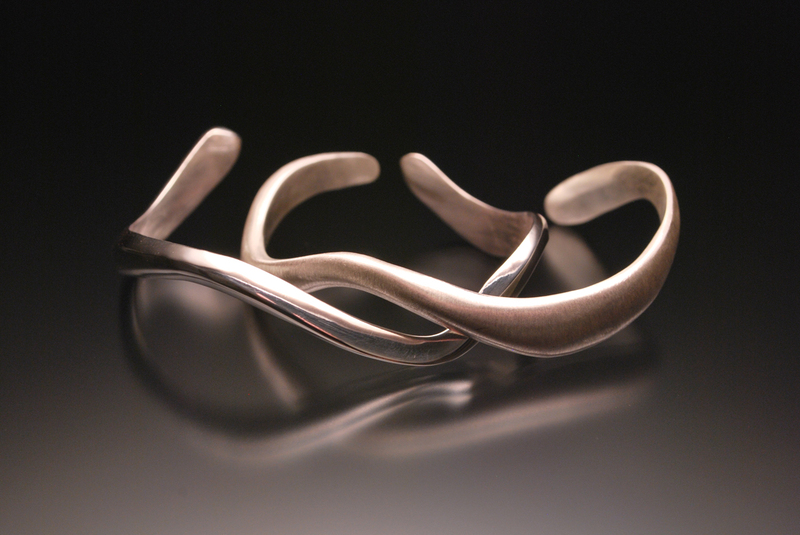 The silver reminds me of night, and the copper reminds me of the day – hence the title: Dusk and Dawn. 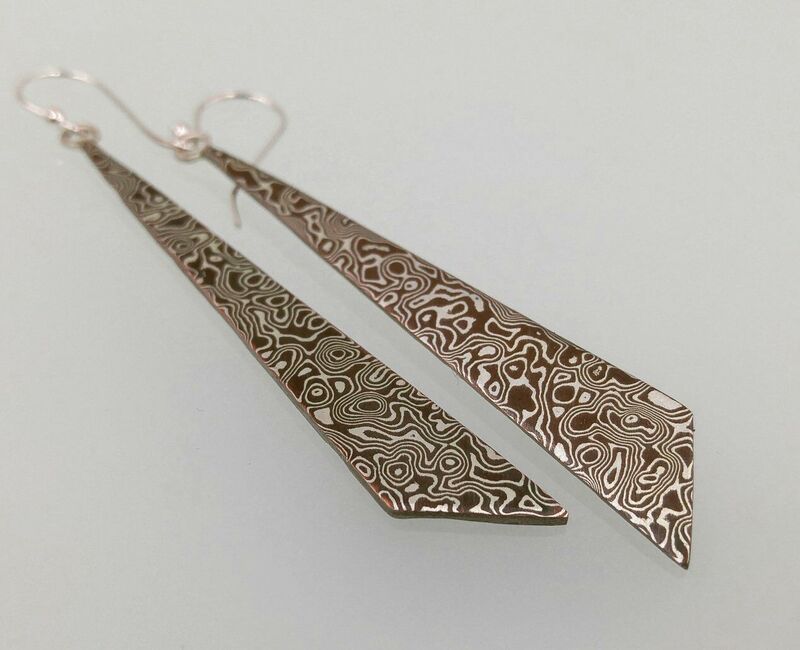 Similar earrings may be made to order. 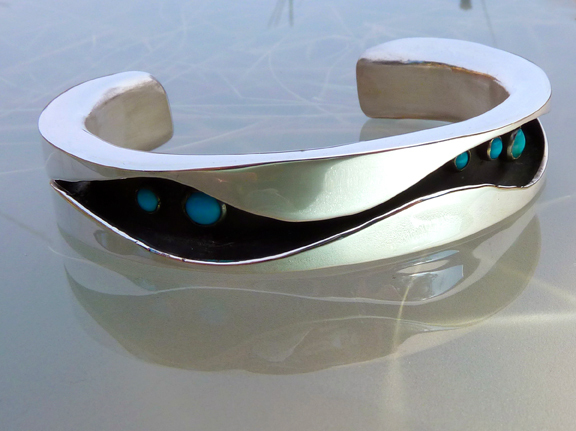 Southwest version of mod/psychedelic—this bracelet has turquoise set all the way around to the edges of the bracelet. The fluid curves of the cut-out and the shadowbox design make this a standout piece. This bracelet is a little over 1/4 of an inch thick. It is completely hand-fabricated and one-of-a-kind. Similar items may be commissioned. This is a hollow-form hand-cut silver and Guadalupe poppy jasper pendant. It is 2 1/2 inches long, 1/2 inch wide and 1/4 inch thick. This pendant is hand-cut with a jewelers saw (not a stamp), and then hand-filed, sanded, and hand-polished. 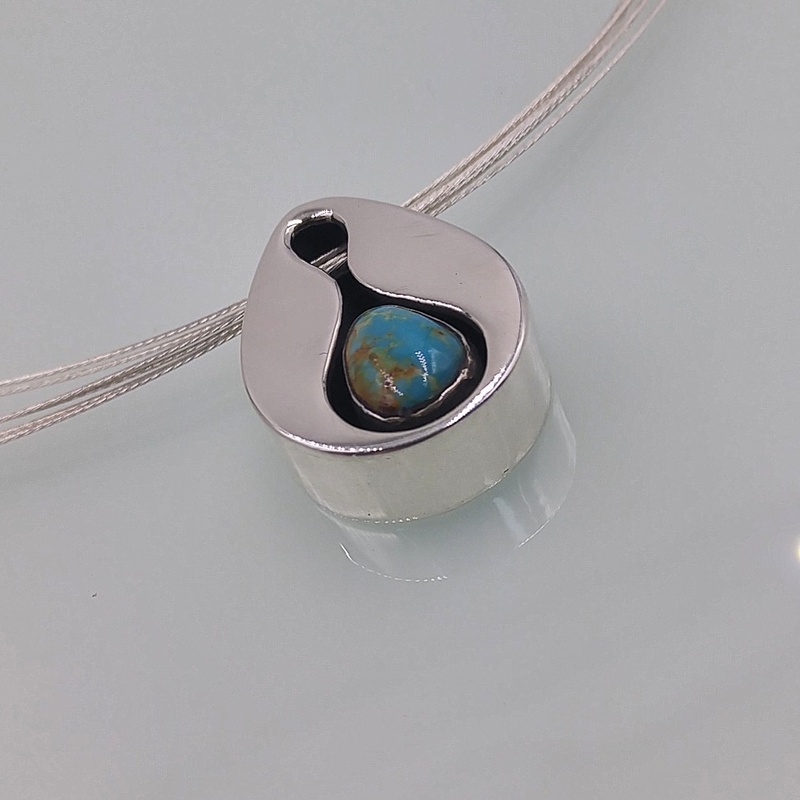 A very striking pendant. The greens, reds, browns and creams of the stone are stunning. Guadalupe poppy jasper is from New Almaden, California. The mine it comes from is now closed and this variety of poppy jasper is considered extinct. This stone was mined at least 3o years ago. It is a collectible and only exists in private stashes. Very rare. Turquoise housed in a modern-styled object with organic detailing make a stunning combination. This is a one-of-a-kind hand-hammered hollow form. 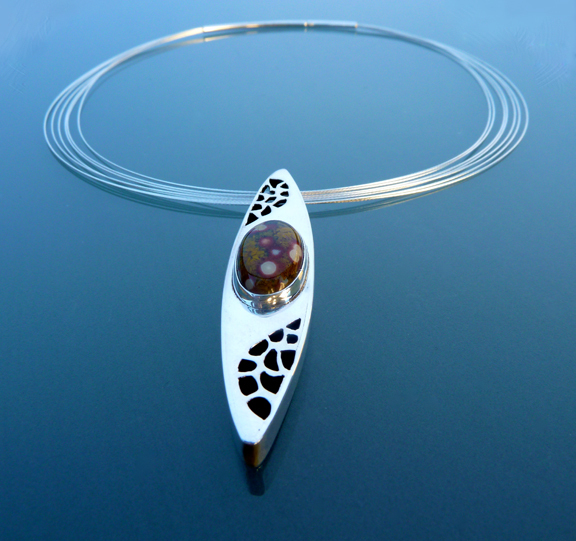 This pendant sold the same day I made it. It is about 2 1/2 inches long, about 1/2 inch wide and 1/4 inch deep. Holes are cut so that the chain can pass through the pendant. SOLD – contact matagisorensen@gmail.com to commission a similar item.